Rotary drums can be configured to serve as a variety of different pieces of equipment, including a rotary dryer, cooler, kiln, granulator, or even a coating drum. With such diverse employment, these robust systems can be used to accomplish a variety of goals across a host of industries and with thousands of bulk materials. While rotary drums are known for their reliability and ease of operation, they can present challenges in some settings, particularly when working with a more difficult material. Explained here are some of the most common issues rotary drum operators experience, as well as how to prevent and/or resolve these issues. Buildup is caused by material sticking to itself, or to the interior of the drum, and is almost always the result of a sticky material. The potential for a material to cause buildup is highly variable, though materials that have cementitious properties, such as gypsum, are especially likely to cause buildup issues. One option for controlling buildup in a rotary drum is to use a liner on the interior of the drum. There are many types of liners, from rubber liners, to stainless steel liners, all the way to ceramic tiles, the choice of which is dependent upon the material and the purpose of the liner. In the fertilizer industry, the liner of choice for rotary granulators is often a flexible rubber liner. Flexible rubber liners are comprised of strips of rubber fixed to the interior and running parallel to the drum. As the drum rotates, gravity causes the rubber to flex downward, sloughing off any material that may have caked on. 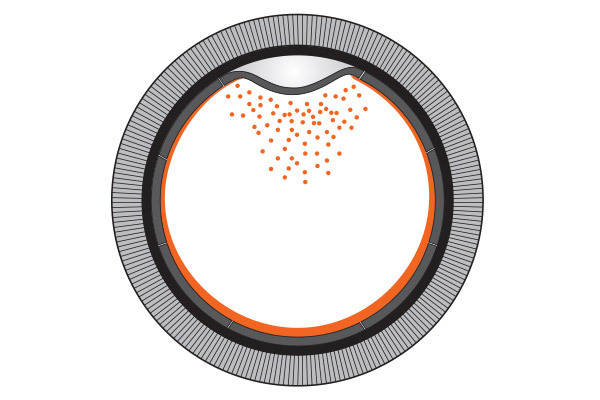 The image above illustrates how a flexible rubber liner sloughs off material buildup by flexing downward as the drum rotates. Historically, the fertilizer industry used scrapers on the interior of the drum to control buildup. However, the industry has moved away from this because of the potential for the drum to “jump,” or jar, due to the scraper coming in contact with a large, heavy, built-up mass of material. 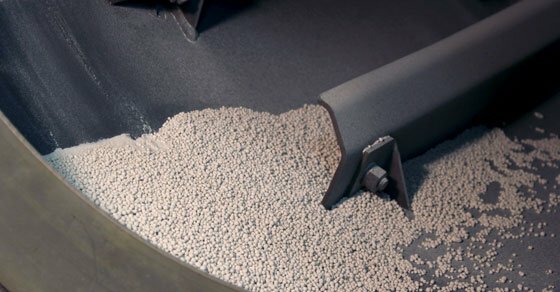 The move from scrapers to flexible liners was two-fold for fertilizer manufacturers, because not only did these liners help control buildup, but they also offered some protection against corrosion. Liners are typically only utilized in applications where heat is not used, such as with granulators, coolers, and agglomerators, as the combination of heat and a liner can cause issues; even a stainless steel liner can run into troubles in a heated operation, because the liner and base materials can expand at different rates, causing thermal stresses. For example, a stainless steel liner inside a carbon steel shell would have a potential for cracking as a result of thermal stresses. 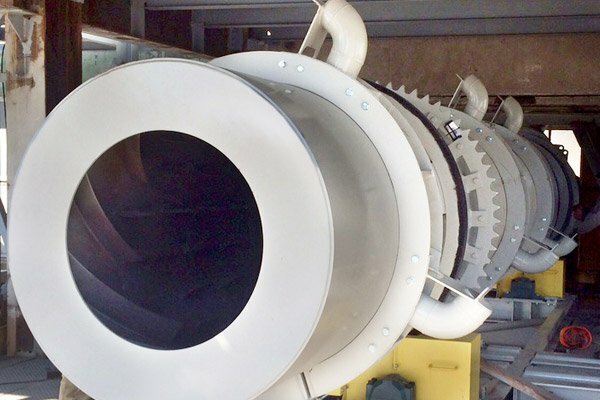 In applications where heat is employed, such as in the case of a rotary dryer or rotary kiln, knocking systems can be installed to help prevent buildup. Available in various configurations, knocking systems are an external approach to buildup control and work by “knocking off” material as the drum rotates. There are two primary knocker designs,: the ball and tube knocker and pneumatic hammers. Ball and tube knocking systems consist of tube-like chambers affixed to the exterior of the drum. Each chamber contains a heavy ball (similar to a shotput), and as the drum rotates, gravity causes the ball to move down the chamber, falling against the drum. A wear plate protects the shell, while still allowing for enough force to knock material off of the interior of the drum. This system is often favored for its ease of installation, simplicity in operation and because it is self-contained. Furthermore, ball and tube knockers require little maintenance. The pneumatic hammer option is a sophisticated knocking system, allowing for a number of variables to be customized and adjusted. Mounted to the ceiling or support structure above the drum, this hammer can be programmed to knock the drum at specific time intervals and with an adjustable amount of force. Varying frequency can also be employed to allow the drum to be knocked in a different location with each strike. One way to prevent buildup is to adjust the feedstock through a technique known as back mixing. Back mixing takes place when dry material is added to the wet, raw material in order to make the material less sticky. However, this is not always an option, as some materials remain sticky for a wide range of moisture levels. In cases such as this, a heated screw could be a more efficient dryer choice. Another way to prevent buildup is to design a less aggressive internal flight (or “lifter”). Because buildup tends to occur in sharp corners, a less aggressive flight can lessen the propensity for buildup to occur. Additionally, having a bald (flightless) section in the beginning of the drum allows the feedstock to dry a little before it is subjected to the flights, also lessening the chances for buildup to occur. In addition to buildup, abrasion and corrosion are also common challenges faced by rotary drum operators. With both types of wear, prevention is the only approach; once corrosion or abrasion has been allowed to act on a drum, only repair and eventual replacement can help. Left untreated, abrasion and/or corrosion can cause severe damage to a drum, even requiring shell replacement in some cases. While abrasion and corrosion can have similar effects on a drum, they are very different in nature. Abrasion is the result of wear from physical action, often occurring because the rotating shell is in constant contact with an abrasive material. As with buildup, liners can be used as a means of protecting the shell from abrasion. Stainless steel, extra thick rubber liners, or even ceramic tiles can be installed to aid in abrasion resistance, though again, this is not appropriate in applications where heat is used. Similarly, bolt-in cast iron plates are also an option in some cases. Another option to protect a drum shell from an abrasive material is to increase the thickness of the actual drum shell, allowing it to withstand more wear. Yet another option would be to design a segmented drum with flanges, so that the critical zone (typically the inlet third of the drum) could be replaced as needed. Unlike abrasion, which results from physical action, corrosion is a result of chemical reactions. Acid, for example will erode a metal shell over time, because the carbon in the metal reacts with the acid, leading to premature wear. Perhaps the most familiar example of corrosion is rust, where iron reacts with oxygen in the air to form iron oxide. Liners are also an option in helping to control corrosion, though again, not when heat is involved. A neoprene liner can be chosen, or corrosion resistant steels such as stainless, alloys, etc., can also be used (these may also help for sticking). Aside from putting in a liner, another option is to construct the shell out of a corrosion resistant material. In some cases, corrosion may only be an issue when the material is within a given moisture range, such as when it enters the drum and is at its highest moisture content. In this case, the inlet section could be made of stainless steel, while the rest of the shell is carbon. The choice of which liner will be most effective in either case – corrosion or abrasion – is dependent on many things, but most importantly : the purpose of the liner, compatibility of materials, and the material temperature. With both abrasion and corrosion, moisture content is also a critical factor in reducing premature wear. Many materials are more abrasive or corrosive within a specific range of moisture content. In some cases, measures such as back-mixing can be taken to ensure a material is within a given moisture range prior to entering the drum to help reduce the potential for wear. Despite their reputation for reliability, rotary drums can still present some challenges, with buildup, abrasion, and corrosion among the most prolific. 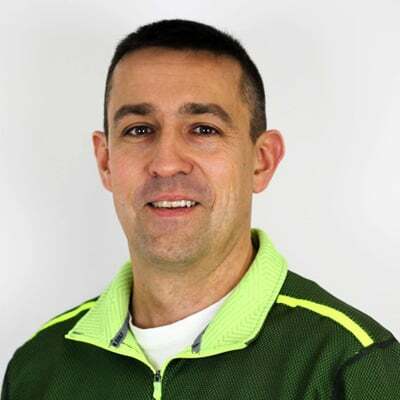 In each case, prevention is always the best approach, whether that be through the use of feedstock adjustment, addition of a liner, or otherwise. Working with a manufacturer that has demonstrated expertise in the design of quality rotary drums is a must for equipment longevity. FEECO has been engineering custom rotary drums since 1951. With experience in nearly every industry and with hundreds of materials, our expertise in building rotary drums that are built to last is second to none. Our aftermarket engineering team can also inspect your process and equipment to determine the best course of action against the issues mentioned above, including retro-fitting a solution. If you are experiencing any of these issues with your rotary drum, contact us today to learn how we can help!